My Man is the ultimate time and space management expert. He can juggle several things at once, never dropping or missing a thing, and makes it looks so easy! I, on the other hand, am the least organized person on the planet! How the two of us ended up together, I do not know! Our house is not the organized dream home you would expect from a time and space management expert. It is messy and cluttered, sometimes embarrassingly so. When my sister and I get together for tea dates, I go to her house. Her home is beautifully organized, uncluttered, calm and serene. I want to be her when I grow up. She is also OCD, but I love her anyways. Early in our married life, I asked My Man to organize me. I wanted time tables, charts, posters, whatever it took to get me inline with his skills. He looked at me with those big brown eyes of his full of sadness, shook his head and said, "I would never do that to you". He did however, give me some ideas that he used. I never did get the hang of it. This is not to say that he didn't do any organizing around the house. He did, in BIG ways. If he was off work for more than a day, he would get so bored. He doesn't have any hobbies (that's a frustration to be shared another day) so he would get it in his mind to reorganize the furniture. It got to be so that our kids couldn't be sure if they would be sleeping in the same room they left in the morning. I would come home from work and find my living room furniture out on the front lawn. Over the years, we all learned to live with it, and to embrace his ability to manage our space in ways that none of us could grasp. It became the norm for me, when faced with the need to add another space, such as a crafting area, to a home bursting at the seams with kids, pets, other family members and all the paraphernalia that goes with life, to mention to him that I would like said space and then leave it in his capable hands. He, unfortunately, left the smaller details of organization in my incapable hands. Trying to organize eight kids and get the 10 of us going the same way at the same time defeated me daily. I am, and always have been, an expert list maker - and I am just as much an expert at misplacing those lists as soon as my pen leaves the paper. I have lists of Christmas decorations from 10 years ago that we no longer own, but I can't find the one I made last year of the ones we do. Starting this blog with my family has been the best thing that ever happened to me! If you have been following along, you will have seen (whether you knew it or not), some major transformations taking place in me. I am by no means the organized diva that I dream of being, for one thing I am not sure what a diva even is, but I have decluttered, dejunked and organized spaces inside and outside our home. It has been a great stress reliever to let go of stuff that I packed away four years ago when we moved into town that never got unpacked. I didn't even open the boxes. I gave it all to my neighbour and told him to do what he would with it. One of the things that I wanted to share with you today is the menu binder that I have shared before. Unfortunately, it has gone the way of the dodo bird. I found it to be too bulky and easily disorganized. I lost menu plans and recipe cards. I decided that I needed a daily planner that I could incorporate almost all my organizing needs in one place, so I am not hunting through binders and piles of lists. It is the time of year when the organizing gurus are posting organization binders, notebooks, labels, etc. There are so many ways to do it. It's all so handy, and pretty!! I have posted a few to our blogs Pinterest board, so you can possibly glean ideas of your own. As for me, I found an organizer that will work for me. It's going to take some getting used to not having to search for it because it sits right on my desk top and it has everything I need in one slim notebook. 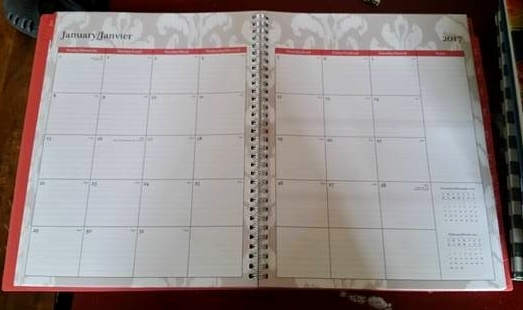 I have a smaller date planner that I can co-ordinate with the main one, and I keep that one in my purse.